The Robinson R22 Is the worlds most popular entry level helicopter. Its exceptional value along with outstanding performance, has made this entry-level helicopter the best for nearly two decades. The Robinson R22 has been delivered to more than 60 countries around the globe. To date, More than 3,600 R22 helicopters have been produced. Records in its class, achieved by its superiority, include speed and distance. Furthermore, the Robinson R22 Beta II is still the industries lowest cost of operation. The Beta II is generously fitted and offers a extensive choice of options. Standard features include a precision-engineered RPM governor, a durable rotor brake, an auxiliary fuel system for added versatility and increased range, plus a high-quality voice-activated intercom. The Beta II's clean aerodynamic design allows a high cruise speed up to 110 mph and an average fuel consumption of only 7 to 10 gallons per hour. The cabin provides comfortable seating for two with removable dual controls on the passenger side. The Robinson R22 is a classic example of design excellence. No other helicopter in its class can match its speed, reliability, affordable price, and low operating costs. 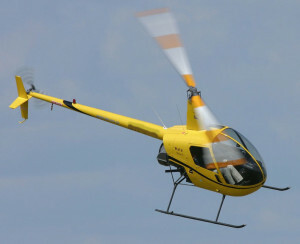 The R22 has fewer accidents due to aircraft or engine failure than other light helicopters, and Robinson's commitment to the highest quality in design, materials, and craftsmanship make it the enduring choice for flight training, radio traffic watch, power line patrol, and other applications that require performance, dependability, efficiency, and easy maintenance. The Robinson R22 is mainly used for Helicopter Training, however it is used for game capture work, aerial photography and whole lot more.